With the advent of digital supply chains, organizations are facing new and demanding technical and business challenges as they navigate the unchartered waters of adoption. Beyond developing a business case for digital investments and growing cybersecurity concerns, the lack of adequate talent to effectively implement these technologies looms large as the biggest risk to business growth. According to the soon-to-be released 2018 MHI Annual Industry Report, 64 percent of the manufacturing and supply chain professionals surveyed said hiring and retaining a skilled workforce is the biggest obstacle impacting their supply chains. Despite this shortage of talent, standing still in the digital age is not an option. For those who invest in digital supply chains and the people who run them, the payoffs will be huge. For those who have a wait and see approach, the repercussions could be severe. To tackle this growing challenge, firms must collaborate with industry associations, universities and career and technical education programs to develop the next generation supply chain workforce. This workforce will look very different as supply chains increasingly require purple people—those with business acumen (blue) and technical (red) skills—to leverage digital technologies and take full advantage of the business opportunities they offer. Technologies like automation, robotics, IIoT and software are supplementing and augmenting human roles in areas such as data analytics, supply chain planning, order and inventory management. The combined power of humans and smart machines are improving operational efficiency and delivering significantly better business outcomes. 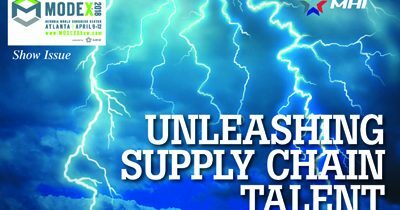 The new issue of MHI Solutions focuses on this important topic from the technologies driving changing skill sets to industry-academia collaboration on how to hire, retain and unleash the power of this new generation of supply chain worker. We have also included detailed information on MODEX 2018, being held in Atlanta April 9-12. MODEX is where the brightest minds in manufacturing and the supply chain are gathering to discuss the trends of today and the challenges of tomorrow. With 900 exhibits and over 100 educational sessions, it’s also where leading companies get reliable information and solid advice about capital expenditures and supply chain investments. Many of these investments are among the submissions for the 2018 MHI Innovation Award which you can view on page 107. The Innovation Award winners will be announced during MODEX during MHI Industry Night on April 11. I hope this issue of MHI Solutions helps provide the information and resources you need to address workforce issues in your supply chain.